The case for global regulation of the banking and finance industry has become much stronger as a result of the recent crisis. The prospect of creating a workable system, though, is as remote as ever. It’s official: The freewheeling, Wild West world of a lightly regulated global financial system has come to an abrupt end. As terrified bankers watching their empires collapse ran cap-in-hand to equally panicked governments, the stage was set for a radical overhaul of not just the world’s entire financial system but also the regulatory structure under which it operates. 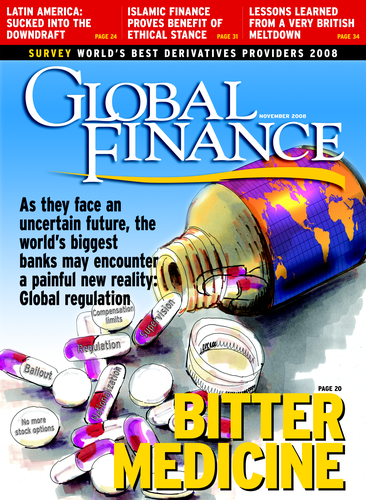 Under the existing patchwork of rules, the global banking industry had become so dangerously intertwined and startlingly opaque that it drove the international financial system to the brink of a systemic collapse that was prevented only by the concerted efforts of—and mind-bogglingly large injections of capital from—the governments of the world’s largest economies. Kay believes that one cause of the current crisis is that banks have been allowed to use implicitly government-guaranteed retail deposits as collateral for speculative trading. “This is what they’ve done, and this has made the scale of that operation possible and now in effect destroyed three of the five independent investment banks that don’t have that base to call on,” he adds. Wolf agrees with Kay that the risk-taking and deposit-handling aspects of banking have become dangerously commingled. “We have allowed banks to provide both an essential utility function on which the entire economic system depends and at the same time gamble freely and at will with next to no capital behind it, essentially at the taxpayers’ expense. That is not tolerable,” he asserts. Today’s turmoil has dramatically changed both the climate of regulation and its scope, says Stephen Lewis, the chief economist at Monument Securities. In some ways the shakeout has created a system that will more easily accommodate global oversight. “There will be a diminution in the number of institutions to be regulated and a decline in the number of viable products. That will make it easier for bank supervisors to step in and regulate. We may not have globalized financial markets in the way we have got used to,” he adds. The regulators now taking control in London, on Wall Street and beyond are demanding greater reach and more power to scrutinize their charges. They will bid to determine the size of bonuses, the competence and qualifications of management and management strategy. What is left of management autonomy after the current cull will be highly circumscribed by regulators armed with new banking laws and a public mandate to rein in the managers. Bankers’ capacity to determine the look of a new and sustainable banking system will be curbed by virtue of their inability to manage yesterday’s system. Governments and banks will also reassess the entire structure of the banking system, its risk base and its management quality and standards. In the short term, says George Magnus, a senior adviser at UBS, governments will get more involved in the structure of banks and their culture, but their influence will reduce as stability returns. “Government intervention is a political as well as economic and financial issue. In the medium to long run the greater activism of the state in the financial system will fade, much as it did in the decades after the 1930s and again after the 1980s,” he says. Underlying the calls for global regulations is a widespread disenchantment among the global financial community with today’s regulatory bodies. Participants and observers are seeking to devise new institutions to replaced failed bodies. Jeffrey Garten, a professor at the Yale School of Management, advocates the creation of a global monetary authority to oversee the international capital markets. “The International Monetary Fund is irrelevant to this crisis, the Group of Seven leading industrial countries lacks legitimacy in a world where China, Brazil and others are big players, and the Bank for International Settlements has no operational role. The US Federal Reserve is too besieged to act as a global central bank,” he asserts. Tim Congdon, a noted British monetarist, joins the chorus of dissent with the global regulatory regime: “The Basel rules have failed. The notion that these rules would sort out the banking system has failed. International regulation has failed,” he says. Devising a workable global regulatory system is tremendously challenging, though. One facet of current regulatory institutions that attracts severe criticism is the level of bureaucracy in institutions that claim to be able to oversee every part of a financial community. Amorphous institutions such as the UK’s FSA, for example, will no longer suffice to keep a watch on the inner workings of the banks, says Congdon. “You won’t get all these national systems under one uniform set of regulations. Insurance, banking, securities are different businesses, and they should have different regulators,” he says. Lack of communication between central banks and regulators has undermined the regulatory system, says the London Business School’s Hahn, adding that the recognition of that fact during the current crisis will give an impetus for a new push for global regulation. “There has been an amazing lack of coordination and duplication. Massive gaps in international regulation have been exposed,” he says. Dominique Strauss-Kahn, managing director of the International Monetary Fund, expects the IMF's role in the post-crisis world to expand significantly. As the dust settles from the financial crisis, observers are anxious that the glaring need for a completely revised global regulatory system is not lost in complacency or throttled by red tape. Scrutiny of bank practices needs to go much further than merely adding to compliance departments and box-ticking, urges Kay. “I am concerned that when people talk about more regulation, they mean more form-filling. That could be entrusted to a compliance department, while everybody else gets on with what they’ve always been doing,” he says. Kay and many other commentators are arguing for a rethink of the entire structure of banking, in light of weaknesses exposed by the credit crisis. New structures should be devised to insulate commercial banks from contagion by risks from investment banks. Kay argues for some form of legislation, mirroring, but not identical to, the Glass-Steagall Act of 1933, the former US legislation that required the separation of general and investment banking. That legislation had an extended life before banks challenged it to the point where it became unenforceable. Regulators planning new structures to prevent a repeat of today’s fiasco have to work within a continuously changing picture. Lewis emphasizes the regulators’ changing remit. “We don’t know what instruments and markets will survive the period of turmoil. Will there be credit default swaps in the future? Will there be an interbank market? It is not unthinkable that there should not be. That will dictate the regulation system,” he comments. However the system looks, though, one outcome is inevitable: The regulators and their governmental masters will have the influence and authority to enforce change on a level that the financial system has not seen for 70 years or more. The cultural and business impact on the banking system can scarcely be imagined.